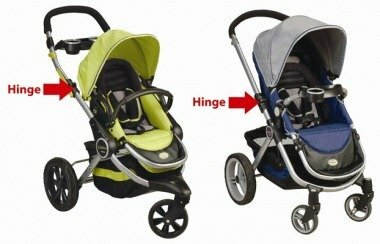 About 36,000 Kolcraft Contours Options strollers are being recalled after three children had their fingers amputated in the hinge mechanism used to adjust the handlebars on the strollers. This recall involves Kolcraft Contours Options three- and four-wheeled strollers with model numbers ZL002, ZL005, ZL008, ZL015 and ZL018. On the ZL002 model, the model number and date of manufacture is printed on a sticker above the left wheel. On the ZL005, ZL008, ZL015 and ZL018 models, the model number and date of manufacture is printed on a label sewn into the back of the stroller seat pad. The strollers were manufactured from January 2006 through November 2009 and sold in various color schemes nationwide and online at Amazon.com, Target.com and ToysRUs.com from January 2006 and June 2012 for between $150 and $160. Consumers should immediately stop using the product and contact Kolcraft at (800) 453-7673 between 8 a.m. and 6:45 p.m. ET Monday through Thursday, 8 a.m. and 3:30 p.m. ET Friday, or visit the firm’s website at www.kolcraft.com to receive a free repair kit.